Who: I’m Autumn and I’m pictured here with my 9 month old daughter, Ivy. Ivy’s daddy is taking the picture. We were spending the week with my in-laws and Ivy’s 2-year-old cousin. We also got to meet some other babies and mamas while walking the beach! 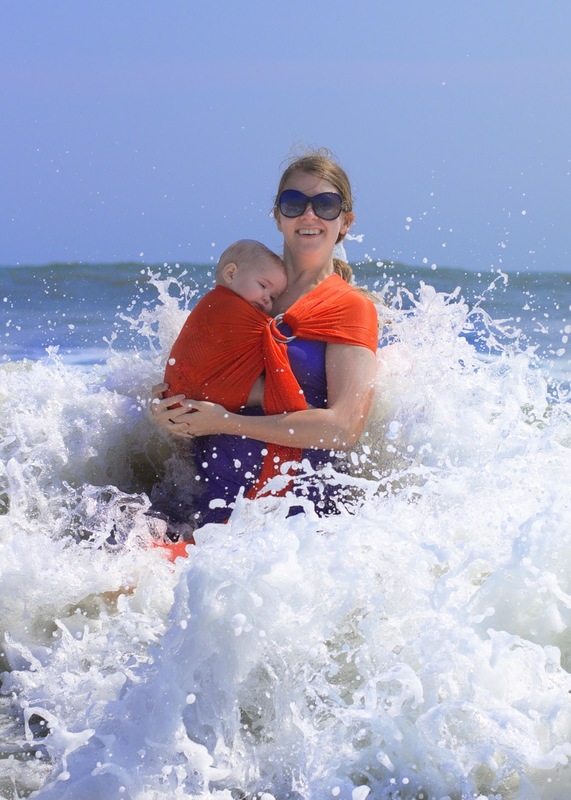 What: This was the second day of our vacation to the beach, and I am wearing Ivy in a Comfy Joey water ring sling. We are in the ocean with big waves crashing around us! I was having a lot of fun introducing her to the waves, the sounds of the ocean, and feel of water and sand. She seemed a little worried, and so she was cuddling me very tight. Why: Safety, safety, safety! I had taken Ivy in the water the previous day without the water sling and felt very nervous the whole time that I might drop her or the tide would whisk her out of my arms. With the ring sling on, I never once feared that she would fall or slip away from me. You can also see from her expression that she was a little overwhelmed by the whole event, so she is snuggling in for security and comfort. I loved it!! !